We’re outta here! With their bags packed and camels loaded, the Jewish remnant of Judah planned to flee to Egypt. They’d had enough. Ishmael had just slaughtered Gedaliah, the king’s appointed governor, and filled an entire cistern with dead bodies. Not only did the remnant fear Ishmael’s return, but they also worried about the king’s reaction to Gedaliah’s murder. Not that they had killed him, but back then they didn’t have Twitter or Facebook to spread the word. Say what? You want us to stay? They’d just witnessed horrific killings, and the Lord was telling them to stay, that no one would harm them? Outraged, they accused Jeremiah of siding with the Babylonians and departed for Egypt ~ against the Lord’s wishes. Ouch. Hadn’t they just said they’d obey whether the news was favorable or unfavorable? At first, their flagrant disobedience blew my mind, but the longer I dwelled on it, I realized that whether it’s disobedience or ungratefulness, He views all sin the same. When God reveals His path and it doesn’t line up with my plans, isn’t my reaction usually disbelief or displeasure rather than gratitude? Case in point: my quest for an agent. My publisher doesn’t require an agent to submit, and since their contracts are fairly straightforward, I didn’t feel the need for one early on. Eleven books and four years later, I would welcome career guidance and appreciate help navigating the ever-evolving publishing industry. So after prayer and research, last year I submitted my Harmon Heritage series to two well-known CBA agents, and both declined representation. OK. So God obviously didn’t want me partnering with them, but I didn’t perceive their rejections as a STOP sign, rather as a YIELD. I kept praying about my writing journey. Feeling a definite nudge to venture into unknown territory, I wrote Roping the Cowboy, my first book targeted for the mainstream market, and queried two more agents who represent both markets. Again, two more rejections. This time, I pouted. Yes, I admit. I pouted, and it wasn’t a pretty sight. “Whether it is favorable or unfavorable, we will obey the Lord our God…” and “Stay here in this land. If you do, I will bless you, and no one will harm you.” The first convicts me; the second confuses. If I’m praying for God to direct my path, shouldn’t I be happy when He responds with either a RED or GREEN light? Sometimes I wonder if the nudge to write stories lacking a distinct faith element, but still sprinkled with grace and hope, was truly from Him. Or had I mistaken His voice for my own? I’m being completely transparent for a couple reasons. Let me just put it out there. First, I confess that I still struggle with discerning God’s will for my life and my writing. I can’t be the only one, right? But it doesn’t let go of me. Because when I hit that pothole of discouragement, God rains down blessings. It may be a sweet friend who listens to me rant over coffee, a glowing review, an invitation to present a workshop because of a referral, or just hearing about someone else’s problems and realizing mine pale in comparison. Sometimes, He plants another idea in my head and characters who yearn for their story to be heard, their hurts to heal, who crave forgiveness or who long for a second chance at love. Other times, He grants me a stellar word count day with peace that overflows from my heart and spills onto the page. So, I’m still tooling down the road until God plants a ROAD BLOCK in front of me. What about you? Has the Lord revealed a different path recently than the one you expected to take? How did you respond? You reign, Lord, in every aspect of my life. Take my hand and lead me where You’d have me go. Obliterate my fears and doubts. Fill my spirit with peace as only You can do. Amen. I loved this post! Thank you so much for your honest words. Sometimes (most of the time?) it is hard to know what God wants us to do. But if we are following Him, doing what He's told us to do, He will bless us. He will give us what we need. It won't be in our time. God has his own time-frame lol. So just when you need something, like an agent, God will send one. And when it happens, you'll be like, that was God. Cause only He could work that out like that. –characters who yearn for their story to be heard, their hurts to heal, who crave forgiveness or who long for a second chance at love–this stuck out at me while reading your post. You have a story to tell. God has given you the words. Use your ability, talent, gifts for Him. He will take care of the rest! 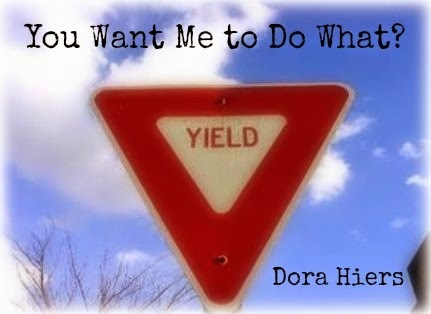 Great post, Dora, and a real hit-hom-er. I am using the near future to catch my breath and re-access. I love your scripture references today. Thank you, dear friend! Between keeping the grandjoys and all those trips to Hawaii and beyond, it's a wonder you can catch your breath, let alone write! You amaze me, woman!! I found you lol! Slowly but surely I find my way around…I love your posts. They make me stop and think. Thank you! Well said, Dora! Well said, my friend! Glad we're on this journey together, even with all the detours and Yield signs!